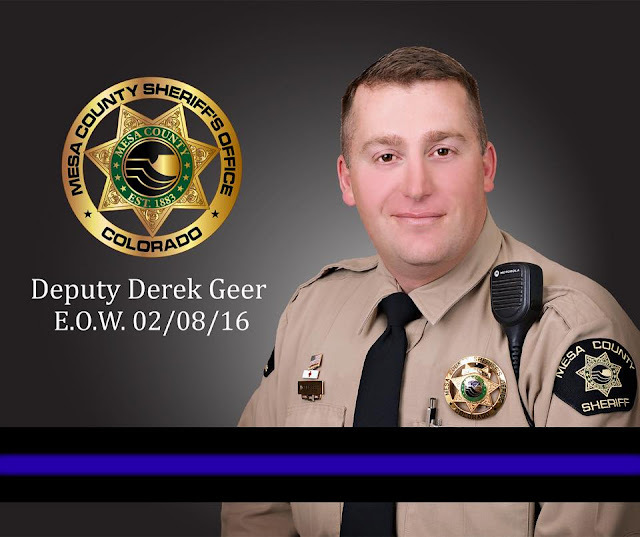 On February 8, 2016, Deputy Derek Geer was killed in the line of duty after responding to a report of a man with a gun. Deputy Geer, a Navy veteran, loving husband, and father of two, served 15 years with the Mesa County Sheriff’s Office. He was honored with the Lifesaving award in 2012 for helping revive a woman in cardiac arrest. As a final act of service and selflessness, Deputy Geer remained on life support until his organs could be donated to four different people. In December of 2016, he was awarded the Medal of Honor posthumously. He is the second Mesa County law enforcement officer to be killed in the line of duty. The Mesa County Sheriff’s Office along with many community members paused for a moment of silence Feb. 8 at 11:15 a.m. to honor Deputy Derek Geer’s service and sacrifice. The Grand Junction Regional Communication Center aired a Code 1 Air Memorial on all law enforcement radio channels in Mesa County. Code 1 Air is a radio call used to clear all radio traffic for a critical incident. Mesa County Sheriff's Office (MSCO) receives mail from the community to honor and remember fallen hero Deputy Derek Geer. MCSO thanks the community for all of the kindness and support they have received during this challenging time. 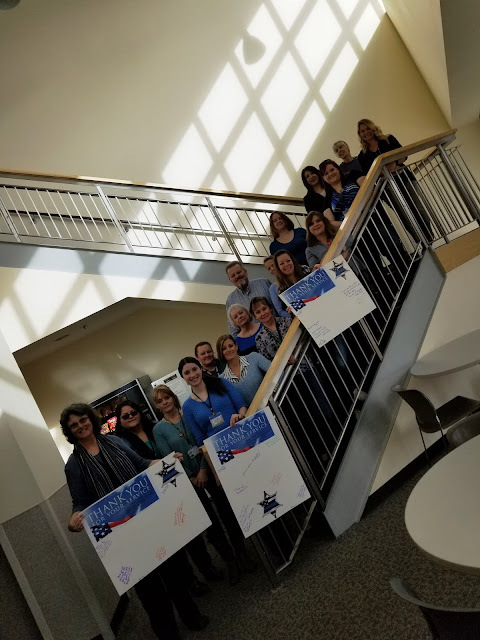 In remembrance of Deputy Geer and thoughts for all law enforcement, the Department of Human Services, Mesa County Workforce Center and Public Health sponsored a "Wear Blue Day" and signed thank you posters, which were delivered to the various law enforcement offices. The Department of Human Services (DHS) Welfare After Hours Team provides a homemade meal for the Sheriff's Office in remembrance and honor of Deputy Geer. Back row: left to right, Miguel Navarro (Assessment CM), Michael Blevins (Con Ops CM), Deni Girardi (Permanency CM), Alexi Kellnhofer (Permanency Supervisor). Front Row: left to right Jacque Berry (CPCL Supervisor), Kari Daggett (Division Director / Child Welfare), Kim Espindola (Adoption CM), Amanda Pennington (Con Ops CM), Sarah Evans (Facilitator), Aletha Jenkins (Assessment Supervisor). Those on the After Hours Team that assisted but are not pictured: Caitlin Donohue (CPCL CM), Holly Nisley (Therapist), Taryn Young (Assessment CM), Ericka Sebring (Assessment CM), Kari Miracle (Adoption CM), Lisa Brutosky (Assessment Supervisor), Lynette Overmeyer (Assessment Supervisor), Joe Kellerby (CW Manager), Kiira Moore (Therapist), Sabrina Blevins (Adoption CM), Stephanie Landes (CPCL CM), Carrie Hoffman (Placement Resource Manager). All of the named staff members not only work their "regular" "normal" job during the week, but they also volunteer for all the after-hours shifts to cover the Child Welfare Hotline, which operates 24 hours a day, seven days a week, 365 days a year. Mesa County Commissioners recognize and congratulate the Finance Department for earning the highest form of commendation in governmental accounting for the 24th year in a row. From left to right, Commissioner Scott McInnis, Accounting Manager Pam Noonan, Budget Manager Eleanor Thomas, Senior Accountant Katherine Boozell, Commissioner John Justman, Commissioner Rose Pugliese. Read more at http://blog.mesacounty.us/2018/02/finance-department-receives-excellence.html. 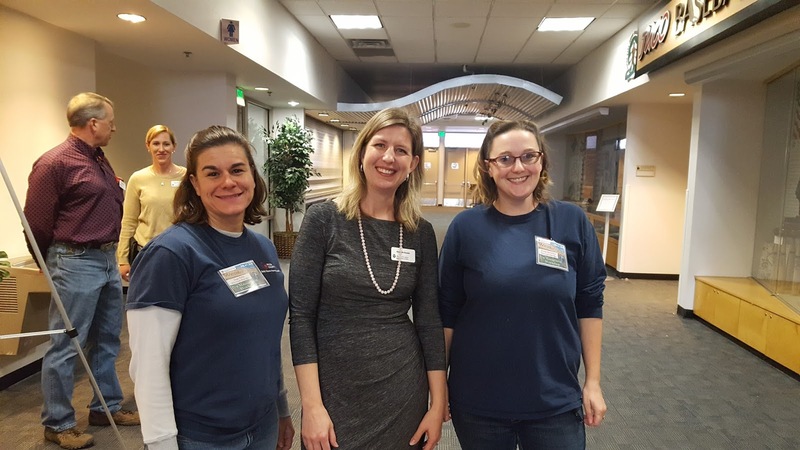 Mesa County Solid Waste Management staff Hope Petrie (left) and Jennifer Richardson (right) and CSU Extension Entomologist Meredith Shrader pause for a picture at the Pest Management Workshop at Two Rivers Convention Center. Hope Petrie and Jennifer Richardson with Mesa County Solid Waste Management gave a presentation to approximately 250 area growers and professionals in insect, weed, turf management and more at the annual Pest Management Workshop. 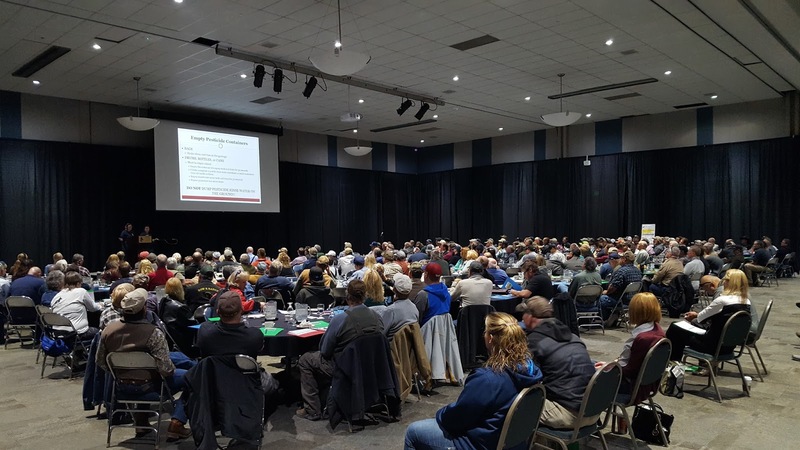 Petrie and Richardson explained the legal requirements for pesticide disposal, and best management suggestions for maintaining environmental and public safety relating to the proper use and disposal of these products. 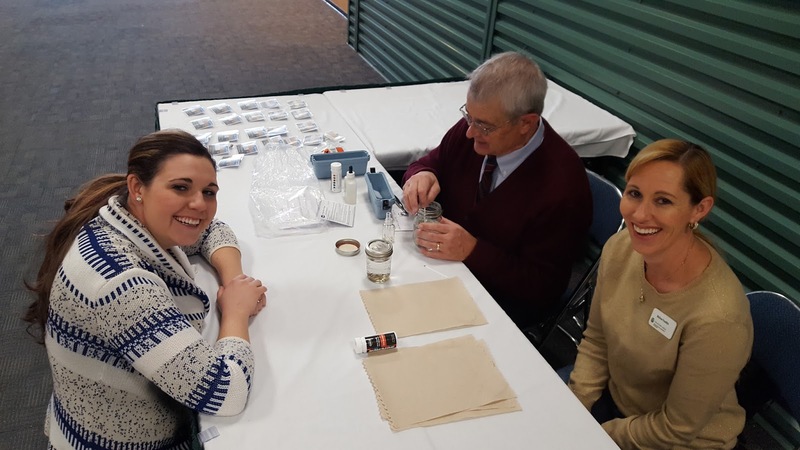 CSU staff member Thia Walker and CSU Extension Entomologist Meredith Shrader at the Pest Management Workshop. This annual 2-day event is put on by the Tri-River Area Extension for local pesticide applicators to learn updated industry research and earn the required continuing education credits for a pesticide applicator license. Dr. Ralph Whitesides (center), retired from Utah State University, demonstrates a water hardness test for CSU Tri-River Area Extension staff members Bonnie Powell and Melissa Franklin. Hard water can decrease the efficacy of specific herbicides and other pesticides, so it is essential to read the labels of the pesticides and learn about the water quality so each application can work properly. Mesa County Attorney Patrick Coleman and Assistant County Attorney John Rhoads participate in an online legal course regarding the land use, zoning and leasing of cell phone towers. Assistant County Attorney John Rhoads participates in a webinar to learn more about the laws that need to be considered when developing wireless ordinances. Information Technology (IT) Senior Support Specialist Eric Farslow does a sound check and makes sure everything is working properly before a webinar for the legal team gets underway. Administrative Assistant Cori Armstrong is a new friendly face in the Mesa County Human Resources Department (HR). 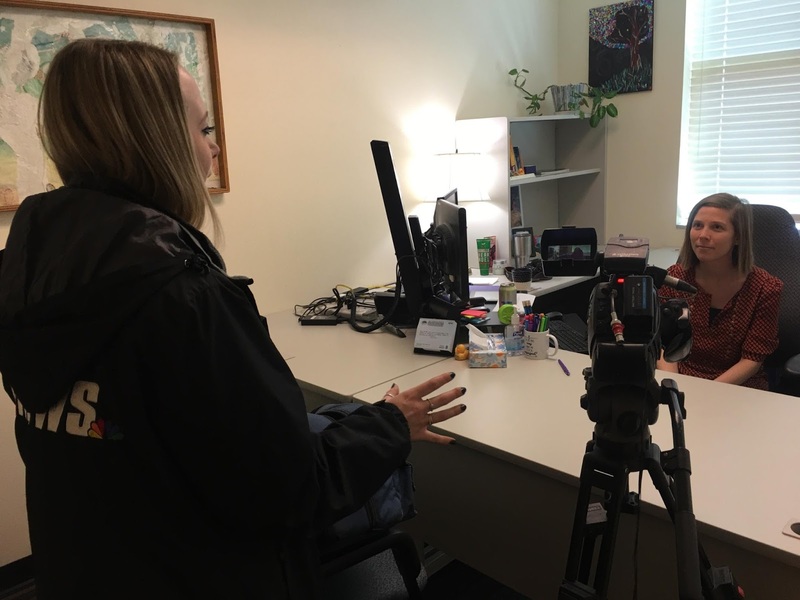 KKCO 11 News Reporter Stephanie Bennet interviews MCPH Epidemiology Program Manager Heidi Dragoo about flu activity in Mesa County, earlier this week. 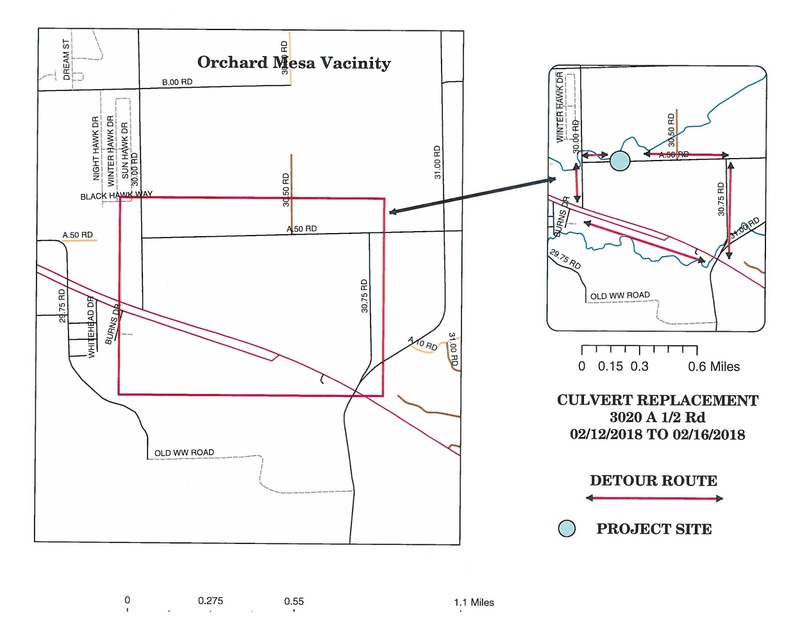 The road closure, in the Orchard Mesa vicinity, at 3020 A 1/2 Road will take place next week Monday, Feb. 12, through Friday, Feb 16. 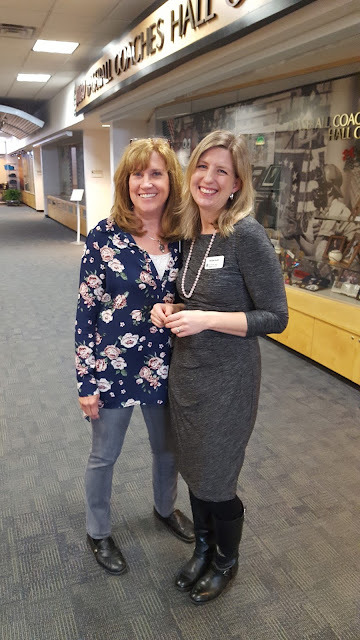 Mesa County Clerk and Recorder Sheila Reiner stops by KAFM Radio to talk about a video series project her office has been working on to promote government efficiency. The videos are playing at the local movie theater, and can also be viewed at https://youtu.be/WEIR9ykqKxM and https://youtu.be/zBGKxB7z18M. 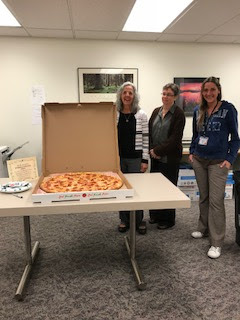 HR staff recognizes the Finance team with a giant pizza to thank them for their hard work and dedication in implementing the new tax tables.